Welcome to our long established business based at the centre of the U.K.
Redhouse Industrial Services specialize in the transport of machine tools and industrial plant. We operate crane-trucks, plant carriers, low-loaders, cranes and forklifts. 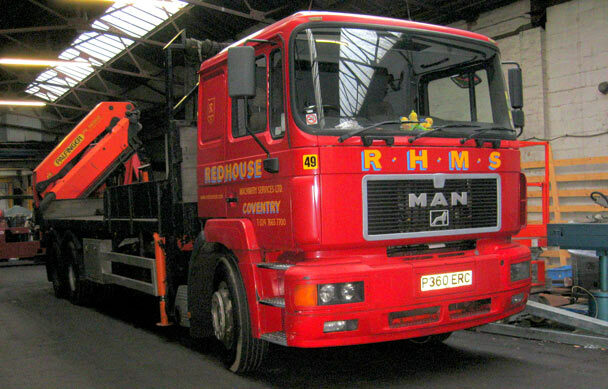 We offer a competitive service whether for single machine moves or for complete factory removals. Our service is supported by a large storage warehouse with lifting facilities for heavy machinery. Prompt response to all enquiries by e-mail, fax or phone. Redistore – Ready when you are. The modern concept of individual storage in lockable containers for the secure storage of commercial or domestic assets. Click onto our Machine Storage page for more information.